Externally pressurized gas bearings have not been the first choice of turbo equipment designers. Aerodynamic bearings, like foil bearings or dry gas seals, are much more popular in use. 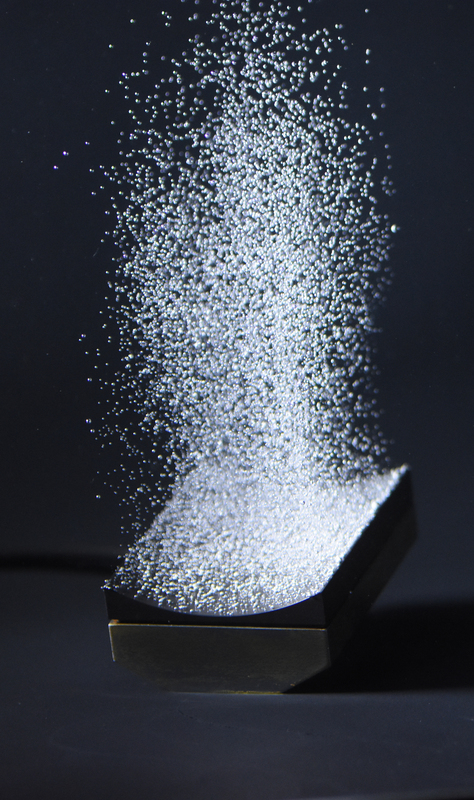 Externally Pressurized Aerostatic bearings do have advantages though, especially with porous compensation. New Way Air Bearings now offers a cartridge type bearing assembly employing Externally Pressurized Porous (EPP) gas bearing technology. 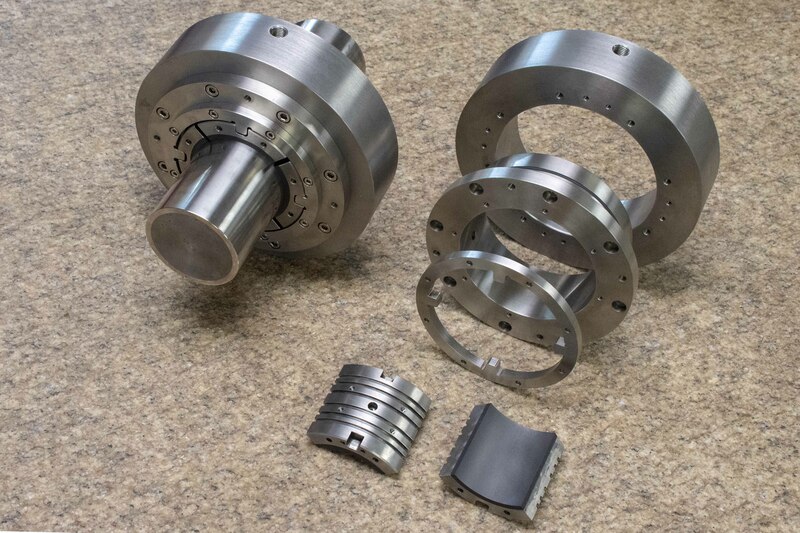 Cartridge assemblies allow for direct replacement of oil-based journal or tilt pad bearing cartridges. Available with thrust bearings, flanged or unflanged, both radial and axial bearings may be split at 180 degrees for ease of assembly. The bearing pads mount compliantly, providing for self-alignment and adjustable stiffness, see Figure 1. The key is the Externally Pressurized Porous (EPP) gas bearing technology, offering the performance of magnetic bearings with the simplicity of oil bearings. The technology represents a relatively new way for the rotating equipment industry to increase efficiencies by reducing shear losses as well as reducing costs and headaches by avoiding maintenance and cooling issues associated with oil lubrication. Externally Pressurized Porous (EPP) gas bearings use the natural porosity of a carbon or graphite face material to restrict and damp the flow of gas into the gap between the face and the rotor. All the porous surfaces are sealed except the bearing face and so pressurized gas introduced through the face acts as oil in a hydraulic cylinder, with pressure times area, forcing the rotor away from the bearing face, shown in Figure 2. With 10 in.² of bearing area and 100 psi input pressure there would be 1000 pounds of aerostatic pressure exerted on the shaft, with 1000 pounds of load on the bearing. At this point, theoretically there would be zero lift and so zero flow but still near zero friction as the air pressure unweights the load from the face. We call this the “balanced force” point. Unless you’re using this principle to reduce wear or heat from a contact brush or exciter, you want your gas bearings to fly on a pressurized film of gas. This means there will be flow, and so less than the source pressure in the gap. With 100 psi input pressure 50 to 60 PSI may be generated as an average pressure in the gap, in this case resulting in 50 to 60 PSI unit loading and 500 to 600 pounds of load with a fly height of about .0002 of an inch, see Chart 1. Unit loading of 900 psi has been demonstrated with 1000 PSI input pressure. The current cartridge bearings shown accept 300 psi input pressure giving about 200 psi unit loading capacity although most operate at less than 100 psi input. 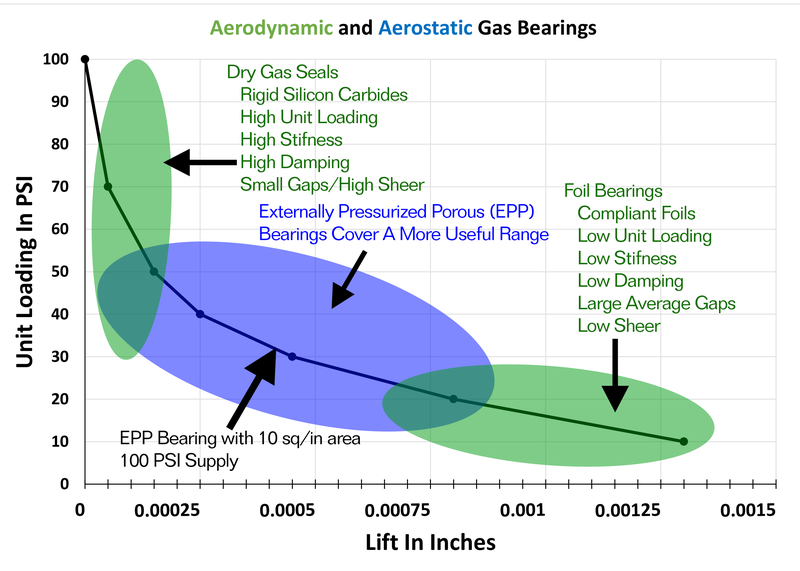 Chart 1 - This is a lift vs. load chart for EPP gas bearings. The slope of the curve is representative of the gas film stiffness. Typical operating ranges for DGS and foil bearings are super imposed to help conceptualized gas bearing technology in turbo equipment. O-ring mounting technology, typically used in mounting a bearing cartridge, is used directly on the bearing segments. New Way has 20 years of experience with O-ring mounted air bushings. These O-rings allow for self-alignment and adjustability in stiffness, Figure 3. The 360 degrees “journal-like” gas bearings are made with gas bearing clearances between the rotor and journal. Since steels expand more than carbons with temperature, temperature change is a practical limitation, significantly changing or even eliminating bearing clearance. 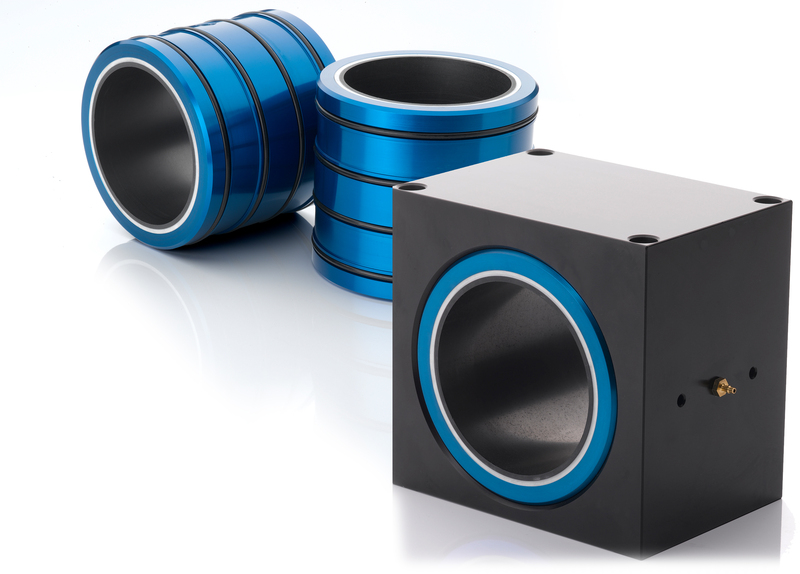 These new cartridges bearing assemblies employ “bushing segments”. Segmentation provides “expansion joints” as the O-rings distribute the load, while still providing self-alignment and damping. This low-profile mounting allows for fitting the bearings into tight spaces. The low friction of gas bearings is also a major advantage. In the continuing drive for system efficiencies, bearing losses are a low hanging fruit. Anytime there is a need to cool lubrication oil, there are losses. There is the original loss from shear then the loss is more than doubled to remove the heat. See Chart 2 for examples of losses at different gaps for oil and gas bearings relative to surface speed. Machines with such dramatically lower power losses would have a lower cost of ownership through the efficiencies and reduced costs from not providing and maintaining oil systems. 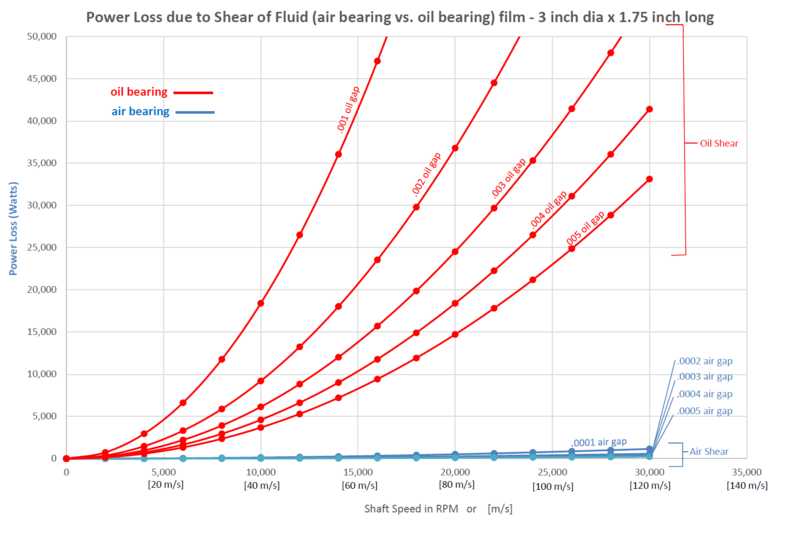 Chart 2 - Comparison of shear power losses in Fluid Films. Low Friction This low friction is also an advantage for maintaining rotordynamic stability. Oil shear friction is responsible for the cross coupled stiffness terms in stability calculations. This friction is the traction the rotor gets trying to climb up the side of the journal and is responsible for whirl motion inside the bearing. Don Bently, founder of Bently Nevada Corp., was a pioneer using eddy current probes to “see” rotordynamic instability problems. After selling Bently Nevada to GE, he founded Bently Pressurized Bearings in an effort to solve many of the rotordynamic problems he had identified with his probes. Don did a great job describing the advantages of gas bearings in numerous articles and his textbook. We use his theories and analysis and have named the bearings “Bently Bearings” after Don. Gas bearings also go well when integrated with high speed motors. There is a trend in the general industry with motors getting closer to the work being done. We see this in machine tools, heavy earth moving equipment, and marine propulsion to name a few. Multiple high-speed motors, each with a single or double stage would afford more freedom of design than internally geared compressors. The stages could be run at varying speeds and located more rationally for intercooling. Additionally, by not needing to reach through oil seals and having the thrust constraint close to the work, the impeller clearance between the impeller and stator can be reduced. This is especially important for smaller higher speed impellers and or impellers working on dense gases.